Lightweight fifth wheels are always a treat to have. Thanks to their lower weight, they don’t warrant a heavier towing vehicle or provide you with difficult towing. It doesn’t have to be limited to just these specific features, though. 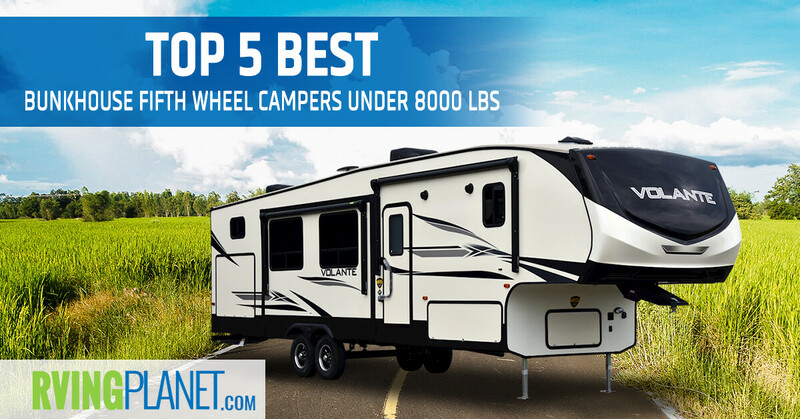 Those looking for a bigger sleeping capacity but still want a reduced overall GVWR can check our list of these bunkhouse fifth wheel campers under 8,000 lbs dry weight. 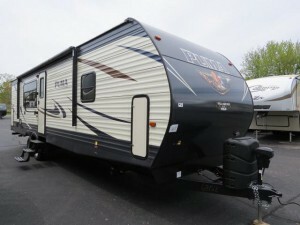 What puts an RV on the list: Finding an RV even with a dry weight of 8,000 lbs isn’t that difficult. But there can be quite a few of them which are from reputable brands such as Starcraft and Crossroads. We’ve selected our top 5 that have the best ratings. Most of these only feature 1 floorplan that meets our criteria, so don’t hesitate to explore all of your options! 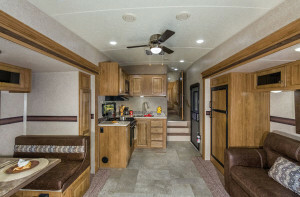 View All Palomino Puma Fifth Wheel Floorplans! 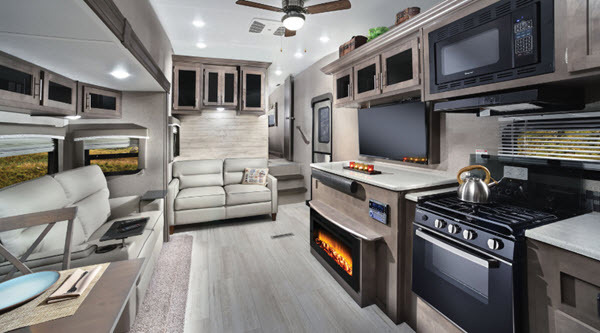 Why we recommend the Palomino Puma fifth wheel: Within just 5 floorplans, the Puma encompasses a variety of different usage scenarios, where the Puma 286RBSS is the one for you, weighing 7,437 pounds in dry weight and sleeps up to 9 people in its 30 feet footprint. 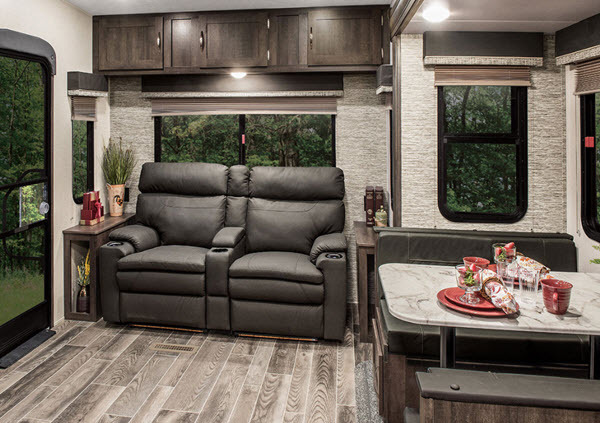 If you’re having a total of 5 to 6 people in the RV, you would enjoy the other floorplans just as much such as Puma 255RKS as well! 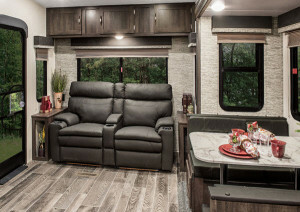 With the included Value Shopper Package, you are in for a treat with the Puma as it includes a TV hookup in the bedroom for future expansion, glass range cover, pre-wiring for a solar system, a jackknife sofa with underneath storage among many others. That is just one of the many available packages that increase the feature list of the Puma fifth wheel! View All KZ Sportsmen Fifth Wheel Floorplans! Why we recommend KZ Sportsmen fifth wheel: Sporting a perfect 5-star rating by people across the RVing forums, KZ has proven itself to be a great rig, especially if you’re looking for sub-10,000 lbs floorplans. 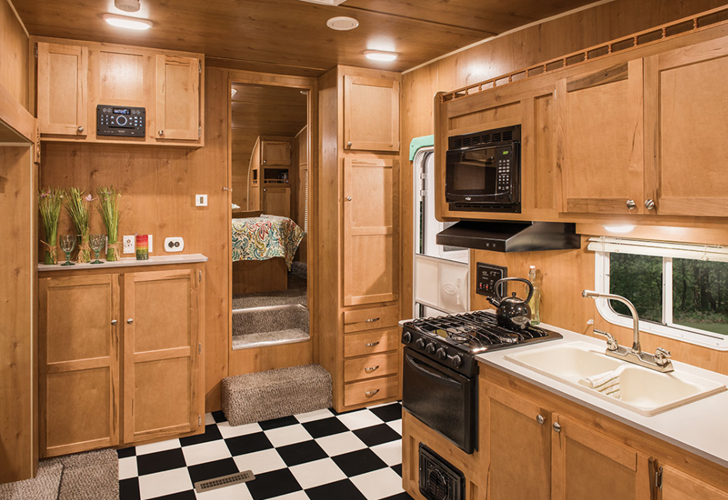 The only bunkhouse floorplan within that weight range is the Sportsmen 281BHK that tips the scales at 7,730 lbs. Once again, if bunkhouses aren’t a must and floorplans that sleep 5 to 6 people is enough, then there are choices aplenty. 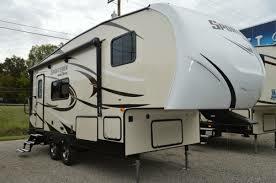 such as the Sportsmen 251RL which is also one of the lightest fifth wheels we’ve ever seen. 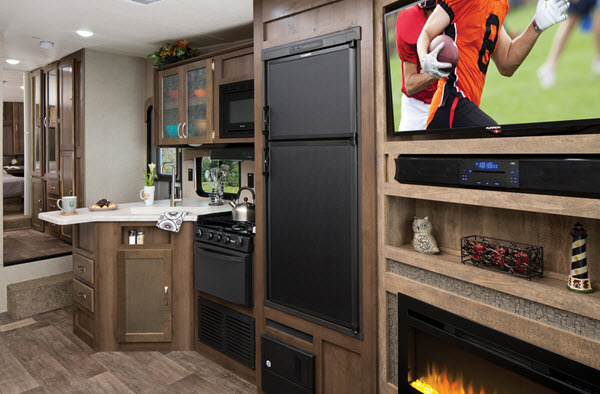 Despite its shorter length at 25 feet (which also makes it parkable at almost every campground in the country), the Sportsmen doesn’t compromise on the features, and still has everything you would want from a quality bunkhouse fifth wheel. 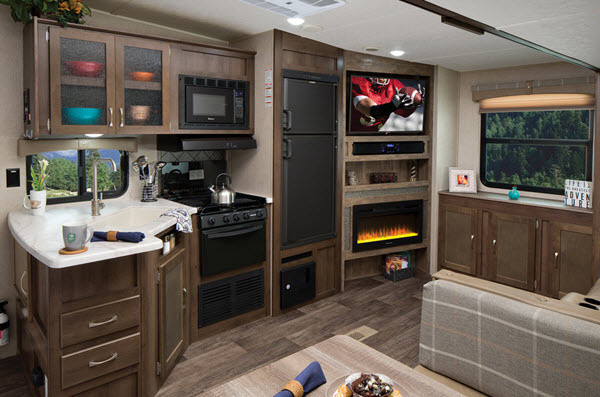 Shower surround, Oven, 3-burner cooktop, radial tires, tinted windows and the 1-piece seamless roof which are upgradeable to better variants has assured us that the Sportsmen isn’t a bunkhouse fifth wheel RV you should miss out on. 8 different floor plans available! 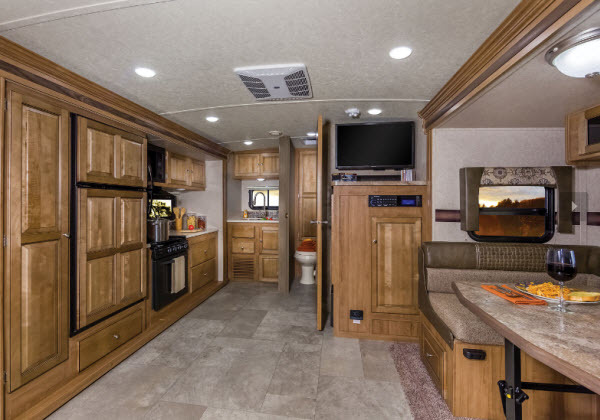 View All Forest River Rockwood Ultra Lite FIfth Wheel Floorplans! 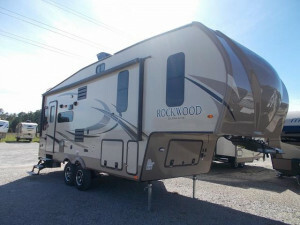 Why we recommend Forest River Rockwood Ultra Lite fifth wheel: The brilliant construction of Forest River continues in the Rockwood Ultra Lite, where features a plethora of floorplans that cover a decent spectrum of weights, sizes and capacities. 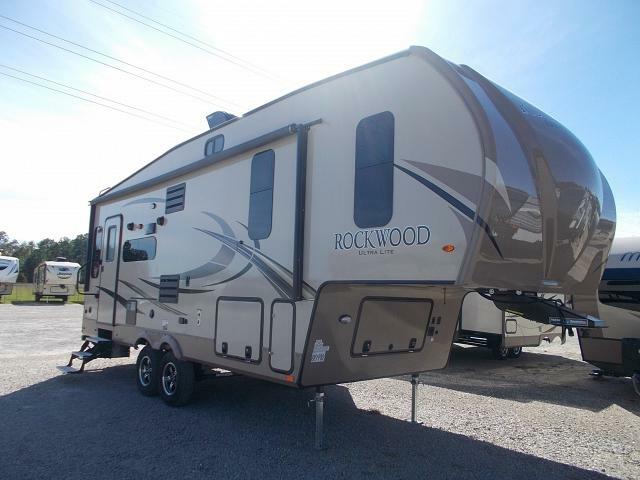 The Rockwood Ultra Lite 2780WS sleeps up to 10 people and is the only bunkhouse fifth wheel floorplan under 8,000 lbs! 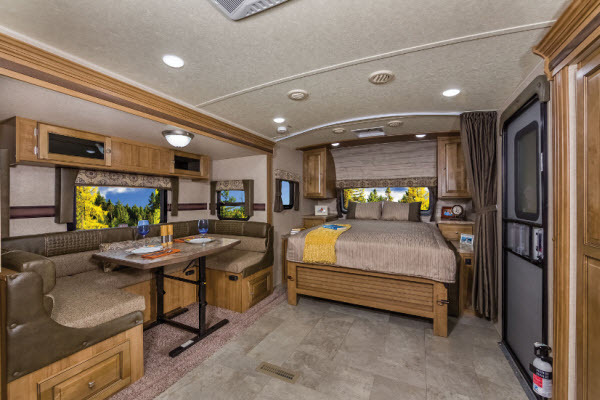 Considering that it’s 31 feet long makes it a commendable RV since the features are laid out in a manner where you won’t feel congested even if the trailer is at maximum capacity. Storage is one particularly good element of the RV, featuring front trunk storage, which is separate from the pass thru storage. The bunkhouse model includes more storage under the Murphy bed, and an option add a 1/2 sliding storage tray.. Apart from that, we have a variety of other features and expansions which we recommend taking a look at by clicking the link below the RV images! View All Forest River Flagstaff Super Lite Fifth Wheel Floorplans! 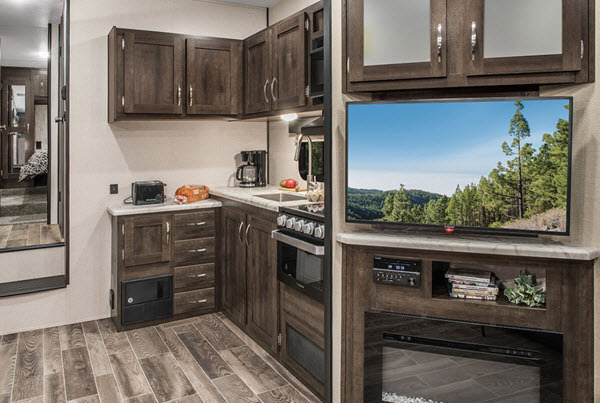 Why we recommend the Forest River Flagstaff Super Lite fifth wheel: If the Flagstaff series and their crazy light floorplans are your thing, then look no further than the Super Lite, which features over 15 floorplans, all of them under 10,000 lbs dry weight. The Flagstaff Super Lite 527BHWS takes it even a step further with a bunkhouse, 32 feet length and weighing under 7000 lbs dry weight! 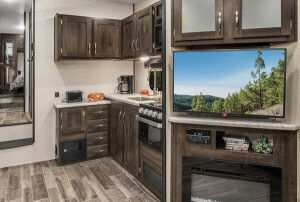 Some of the proprietary features that we’ve come to enjoy in Forest River RVs are featured here as well, the most notable of them being the Wi-Fi ranger and booster that, no surprise, increases the range. Apart from that, it has a beautiful driftwood interior, floor ducted furnace, monitor panel switch station, free standing table, bathroom skylight, good insulation on the sidewalls, floor and ceiling, and this list goes on–excluding the equally large list of options available too! Great For Some Good Ol’ Camping! 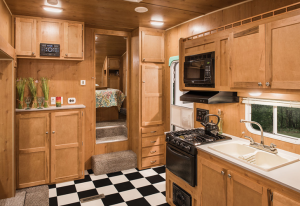 View All Riverside Retro Fifth Wheel Floorplans! 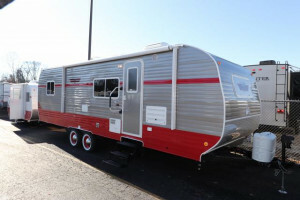 Why we recommend the Riverside Retro fifth wheel: A fifth wheel variant to the highly acclaimed Riverside Retro travel trailer, the Riverside’s fifth wheel Retro 526RB floorplan features a bunkhouse and keeps it lightweight at 6500 lbs. 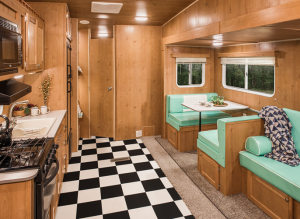 They do have 2 other floorplans that are almost similar in terms of weight, but also features a walk-thru bathroom and a rear kitchen/living area. Of all the features, the most unique and probably the most noteworthy feature is its interior package that gives it that appealing retro style that is in style right now. But for all of that nostalgia, it still has modern features that include but aren’t limited to a Lo-Pro 15,000 BTU AC, oven range, USB port along with options to add an exterior BBQ grill, outside speakers and power awning–making it a perfect choice for those who want to spend their time outdoors while camping, as well! Bunkhouse fifth wheel campers are a very specific group of RVs, but they have a selection that will still leave you overwhelmed. 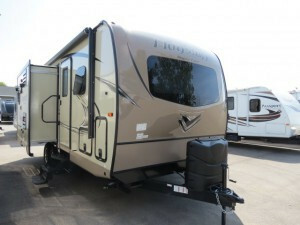 Let this guide make the purchase process easier and get you an RV that will last you for a long time! Share with us your favorite bunkhouse fifth wheel campers under 8,000 lbs in the comments below!